Choice Market employs a touchscreen kiosk for placing food orders. When it comes to brick-and-mortar retailing, the customer experience is king. At this year’s SN Summit, two innovators in the foodservice at retail space will speak about the opportunities that exist in creating a compelling in-store shopping experience. Rick Finley comes to Fresh Thyme following stints at Whole Foods and H-E-B. With more than 40 years’ experience, Finley will share the insights into creating the unique shopping proposition that this growing Midwest retailer delivers. Finley joins a Fresh Thyme team that flips the script, so to speak, on the traditional grocery store layout by putting traditional “perimeter” departments in the center of the store. While the retailer slowed its expansion plans (although not stopping completely as new stores just opened this summer in Pittsburgh), the chain is focusing on long-term success, said CEO Chris Sherrell earlier this year. 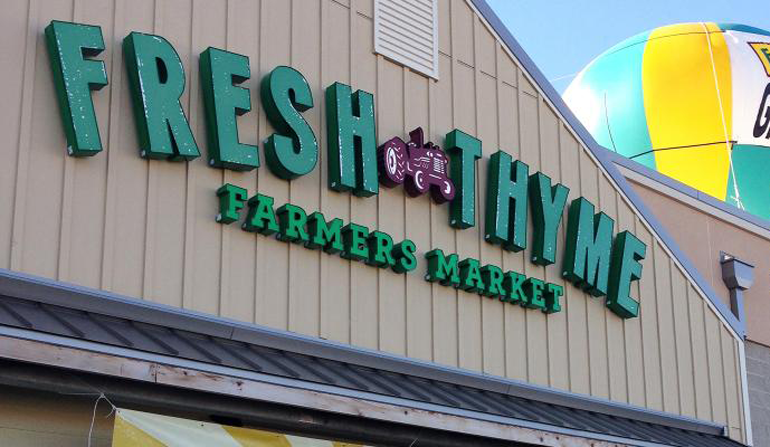 Fresh Thyme is strategically slowing its growth after rapidly reaching 68 stores in four years. Mike Fogarty is trying to remake the “c-store” with the new Choice Market concept in Denver. By offering products his consumers can’t find elsewhere as well as some truly amazing food, Choice Market is drawing in customers — particularly Millennials. The 2,700-square-foot store features a basic grocery selection including perishables, shelf-stable grocery items and toiletries, as well as an extensive menu of both made-to-order and grab-and-go prepared foods featuring fresh, local ingredients. It includes a touchscreen kiosk and mobile app for placing food orders. You can learn more about Fresh Thyme and Choice Market at the inaugural SN Summit, Oct. 1-3 in Dallas. Rick and Mike will join SN Editor-in-Chief Becky Schilling for the “Dare to be Different” interview session at the SN Summit on Monday, Oct. 1 from 3:05 to 4 p.m. The Summit is co-located with MUFSO (Multi-Unit Food Service Operators) conference, providing the only opportunity for retailers and restaurateurs to meet and learn from each other. Learn more at SNSummit.com.